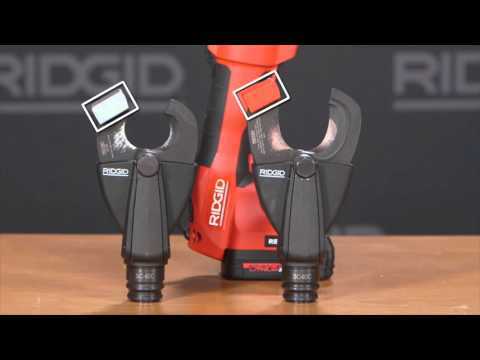 The RE 6 Electrical Tool, featuring the patent-pending RIDGID QuickChange System™, incorporates a moveable collar that lets contractors quickly and easily switch between three rugged, interchangeable heads with 360° rotation: the SC-60C Scissor Cutter Head; the 4P-6 4PIN™ Dieless Crimp Head and the PH-60B Knockout Punch Head. The RE 6 eliminates the need to carry multiple, dedicated tools to the jobsite or completely switch from one tool to the next, which increases efficiency and maximizes productivity. Interchangeable heads allow for the tool to be customized to meet individual needs - cut wire, crimp lugs and punch boxes with one tool. Inline design for easy, one-handed operation even in tight spots. Built-in sensors and LED indicators ensure tool performance, monitor battery life and indicate when the tool requires service. 3-in-1 tool saves valuable cargo space and eliminates trips back and forth to the truck searching for different tools. Six ton hydraulic force output to cut and crimp up to 750 kcmil (MCM) and knockout holes up to 4". Automatic ram retraction when cutting and crimping. Bright white LED workspace illumination light. Rubber overmolded grips for comfort and control. Nylon straps allow easy tethering or hoisting. Approximate Cycle Time 5 seconds. RE 6 Cable Termination Tool is rated 4.8 out of 5 by 13. Rated 5 out of 5 by bodiestaxi from No idea I've used rigid tools since Emerson.Was and still is the best! Rated 5 out of 5 by DerekSummitt from Awesome tool, very robust! This tool has held up to every and all my expectations! Very solidly built tool, very high quality. Rated 5 out of 5 by Beno from Excellent product I like all the ridgid tools because they make the work easier, I recommend them. Rated 5 out of 5 by 19JRW52 from Rigid against all other brands, I'll take Rigid everytime. Have been buying Rigid for years. Durability, Warranty and customer service beyond reproach. I'll buy Rigid everytime. Rated 5 out of 5 by Danielo from This product is easy tu use and produces professional results. Efficient, reliable and produces professional results. Rated 5 out of 5 by weekendwarrior808 from This works great and is a great deal with 2 batteries. Great product! I appreciate the warranty. It good to know I'm covered for life. Rated 5 out of 5 by FacilitiesManager from Wow We purchase this because of an employee that has a bad shoulder and using the hydraulic crimpers was very hard on him and when he started using this our product was getting to the customers even faster and now all of our employees are using it and we will be purchasing another one. 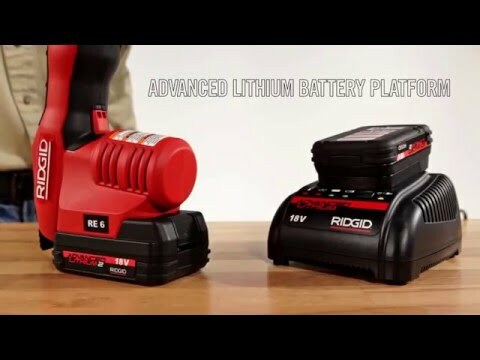 What is the difference between the re6 and the re60 3in1 electrical tools ? In my opinion there is no different it it personal preference. It depends how and where you use it. Are these compatible with regular Ridgid batteries?